Hubby and I travels a lot. He loves to take pictures of every places he visited and have them all stored in a hard drive. When we moved to US from Qatar, all the hard drives were packed in one of the foot lockers and I never had the chance to unpacked them. Last month, we moved from Oklahoma to Texas, and some of the stuff were still packed including the old photographs. 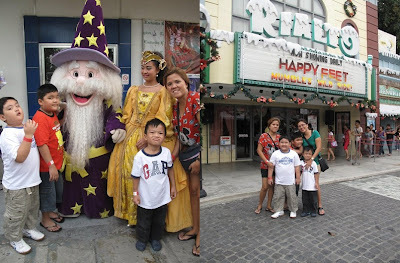 One of those pictures were our trip to Enchanted kingdom on our 2005 vacation to Philippines. That was hubby's second trip back home. 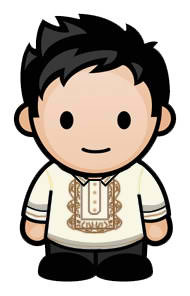 Hubby loves to travel around the globe and Philippines is his favorite place to relax and unwind. In fact he is planning to retire there with me someday when all the kids are grown. Enchanted Kingdom, located in Sta Rosa, Laguna, is the first and only world -class theme park in the Philippines that was opened to public in October 19, 1995 and now on its 17 years of giving the Filipino a fun place to spend the holidays and weekend. Right now it is the "Disneyland" of the Philippines. There is no comparison between the Disneyland and Enchanted Kingdom when it comes to size, fun rides, attractions and activities but at least the Philippines is proud to have something to offer to their people. Here are some pictures taken from my sisters photo album during our 2010 visit to Enchanting Kingdom. You can see how everybody enjoyed the amusement park. Brooklyn Place- Take a journey down the street of Brooklyn, one of New York's five borough and reminisce the years of silent movies and slapstick comedies as entertainers parade down the cobblestone street. Portabello- The sights and sound of the Caribbean Atmosphere can be found in this zone. Rio Grande is the parks largest attraction were you can get wet and wild. Boulderville- Is inspired by the dinosaur era, this prehistoric cartoon zone will capture your kids imagination. Dinosaur mascot and puppet show entertains everyone who set foot in this zone . Victoria Park- This park is inspired by Queen Victoria era. Grand Carousel is the zones centerpiece attraction.The parks mascot,"Eldar the Wizard" is here for you to meet, greet and take photographs. Midway Boardwalk- Coney Island, "Americas Playground" in the 1930's comes to life in this zone. They have Anchors Away, which I don't recommend so much coz this is really too scary and breathe taking, Up Up and Away, Bump N' Splash and more. Jungle Outpost- This zone sets in the the heart of the Amazon in the jungle of Central America. The main attraction is the jungle log Jam and the Swan Lake. Spaceport- Here we can find the country's first and only triple loop coaster that turns riders upside down six times- 3 times forward and 3 times backward. Enchanted Kingdom is really world class and in terms of the amenities and cleanliness, it can compete among the world's best. It was also fun that we had an Outbreak Manila (Zombie Run) event here that even captured CNN's attention. Sad to say, but we haven't visit this world class amusement park yet. We now have a lot things to be fulfilled back at home. We'll surely visit EK in the future. How lucky am I to have this amusement park so close to my place. It will be fun if you go late and see those firework display. We were able to visit Enchanted Kingdom last year. Though their ticket for the ride-all-you-can increased to 600 pesos. I love the Rio Grande Rapids and the flying fiesta.. These 2 rides is something I love to be doing again and again when I get to visit EK. Enchanted Kingdom was my first love, still the biggest and enjoyable amusement park in the country.